Pages full of indecipherable codes are all that stand between DEA agent Brock Martin and drugs crossing the border. But if he wants to crack the case, he'll have to work with Texas Ranger Gisella Hernandez. 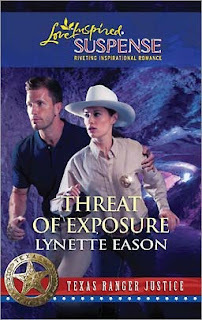 Brock feels the case is way too dangerous for a female agent—especially one who refuses to admit she needs protection. Yet as they work together under the most dangerous threat of exposure, Brock discovers Gisella is stronger than she seems. And that his cowboy heart isn't so tough, after all. DEA agent Brock Martin stared at the man behind the gun. The man who was supposed to be his informant. The man who'd sold accurate information to him over the last year. A man who Brock hadn't come to trust, but had come to rely on. The cold January wind blew across his face, but that wasn't what caused his violent shudder. "What are you doing, Lenny?" One minute they were talking like always, the next, the weapon had appeared in Lenny's hand almost before Brock could blink. The move had been totally unexpected and Brock drew in a deep breath, ready to draw on all of his hostage negotiation training. Then Lenny gave a smile that chilled his blood. "I got a better offer from Harry Lowe. He decided you've caused him enough grief and lost profit." Harry Lowe. A big-time drug dealer along the Mexico-Texas border. Brock had been working this area between Juarez, Mexico, and El Paso, Texas, a long time. But one small slipup and he could die. Lenny's cold eyes and steady hand holding the weapon said Brock had slipped up. Dread and fear clawed its way into his chest. He swallowed hard trying to figure out how he'd ended up in this predicament. "Lenny, come on, man, you don't want to do this. Everyone at the station knows I'm meeting with you. And they're waiting for me to get back with whatever you have for me." A nervous twitch of Lenny's left eye told Brock that it didn't matter. The man's hand trembled as he stared down the barrel. Right now Lenny was more scared of not doing what Harry Lowe wanted than he was of going to jail for murder. Not a good situation for Brock. More fear and no small amount of self-disgust curled through his gut. He'd gotten careless. Now, it seemed it might be his night to die. He'd always wondered how it would happen. How he would go. If he'd be ready. His mind formed the prayer even as he calculated the odds of successfully jumping Lenny. He realized he would have no chance of tackling the man or reaching for his own weapon, now on the ground to his left, before Lenny pulled the trigger. So he had to make a choice. Jump Lenny and take his chances or bolt for cover and hope Lenny's aim was off. Bad odds all around. Lenny sniffed and aimed the gun point-blank at Brock's head. "Sorry, dude, but a man's gotta do what a…"
"Put the gun down, Lenny!" the voice came from Brock's left behind the trees. Lenny jerked, whipped the gun toward the voice, and pulled the trigger. Brock darted to the bumper of his vehicle, wishing he hadn't kicked his weapon quite so hard when Lenny had demanded he drop it. It glinted under the streetlamp ten yards away, mocking his incompetence. Then he heard the pop of another bullet and felt the buzz as it careened past his cheek to plant itself in the asphalt beside him. God, get me out of this, please. I'm not ready to face You yet. Adrenaline pumping, he rolled for cover even as he heard the discharge of another weapon, the howl of pain and the thud of a body hitting the asphalt. Running footsteps echoed behind him as he lunged for Lenny, who now lay face down, and kicked his gun from his outstretched hand. Brock flipped the man, then planted a knee in his would-be killer's back as he swiped the cuffs from his belt. Through gritted teeth, Brock muttered, "You're under arrest for the attempted murder of a law enforcement officer. You have the right to remain…" He broke off as a pair of boots stepped into his line of vision. With Lenny's hands securely fastened behind his back, Brock allowed his eyes to travel north from the boots, up a pair of jean-clad legs to a belt fastened around a slim waist he could probably span with his hands. He let his gaze wander on up to the white shirt with a badge. A badge with a star inside it. Right over the wearer's heart. She held her weapon ready and steady. When he finally reached his rescuer's face, he knew in his gut exactly who'd saved his life. "Hello, Ranger Hernandez." Brock hauled his now-subdued prisoner to his feet and stared at one of the most beautiful women he'd ever seen. Tall, lean and fit, she kept steady brown eyes glued to his. He swiped an arm across his forehead. "I'll say this for you. You have impeccable timing." Ranger Gisella Hernandez flipped her braid over her shoulder and stared at the man she'd already decided she didn't like very much. Number one, he'd stood her up. Number two, he'd met with a known drug runner without any backup. Number three, he hadn't said "thank you" for her saving his life. And she was supposed to work with him. As if she needed life to get any more interesting. Give him a chance, she ordered herself. She gave her hat a shove back on her head and addressed his timing comment. "You were supposed to meet me over two hours ago. I don't like to be kept waiting." The man before her blew out a short laugh. "And I don't like to look death in the face. Looks like neither one of us was meant to be happy tonight." For some reason, that comment amused her. She appreciated the fact that she didn't seem to intimidate him, as her badge seemed to scare off more men than it attracted. Gisella fought to keep the smile from curving her lips, but wasn't sure she succeeded when he raised a knowing brow. She gestured toward Lenny. "How's he?" Brock shot the man a disgusted frown. "It's a shoulder wound. He'll live." Gisella thought she heard a silent "unfortunately" on the end of that last sentence. "I wasn't gonna kill you. You got this all wrong," Lenny whined. He looked at Gisella. "I can't believe you shot me." She turned to the dealer and gave him a stare that made him cringe. "I wouldn't have given you any warning if I'd had a choice." She looked at Brock. "You were right in my line of fire. I had to do a little maneuvering." So that was why she'd yelled. Typically, in that kind of volatile situation, a cop shot first, two lethal pops to the chest, and it was over. Her eyes frosted even more as she said to Lenny, "You're lucky I always hit what I'm aiming for." "And you were going to kill me," Brock ground out. "A fact I'll be happy to testify to," he said as he pulled the man to the car. As mad as he was at the man, he wouldn't make him wait in the cold for the EMS. He wasn't giving Lenny anything else to complain about that would prolong their night. "And I make a pretty good witness," Gisella offered. Then she sighed. "I'll meet you at the station. I guess I'm going to have a lot of paperwork to fill out tonight. Not to mention calling my captain and getting him to do some fancy talking so I'm not assigned a desk job while this is investigated." Brock grimaced. "I'll have to wait on the EMS to get here. I'd transport him, but don't want to have to clean out my car. Speaking of which, there's a videotaped recording of everything that just happened. Your boss shouldn't have any trouble getting this cleared up ASAP." A glimmer of respect finally reared its head. "That'll help a lot." He nodded. "I'll get someone to take over for me and meet you in half an hour." "I'll be waiting." She shot him a pointed look. "Again." He gave her a slow smile and Gisella felt her heart tremble at his low, "I'll be there." A little unnerved by the attraction she felt for a man she'd just met, she shook her head and headed for the vehicle she'd left parked on the other side of the trees. Gisella had flown down from San Antonio, grabbed a cab and rushed to meet Brock Martin, one of the drug enforcement agents assigned to the El Paso area of the border. El Paso was a twenty-minute drive from Boot Hill, which was a five-minute drive from Juarez, Mexico. Her objective was to pick Brock up and head straight to Boot Hill. She hadn't planned on getting sidetracked saving his life along the way. But I guess You weren't ready for him to die yet, were You, Lord? Thanks for using me in this situation. Now, please, please help me find the ones responsible for the drug smuggling and the murder of Captain Pike. For the past four months, Gisella and her company of Rangers had worked hard trying to gather the evidence needed to take down the organization responsible for their leader's murder. Just recently, she and her fellow Rangers had taken the information contained on the flash drive they'd found on Melora Hudson's estate a few weeks ago and narrowed down the possibilities of where the drugs could be entering the country from across the border. Melora's husband had been killed because of his association with the Lions of Texas, an elite group responsible for millions of dollars worth of drugs coming over the border, and Melora had almost been killed herself. Fortunately, they'd found what the killers were after and now the Lions had no reason to go after her anymore. And thanks to the information on the flash drive, Boot Hill seemed to be the next logical choice in their hunt for the top members of the criminal organization. Gisella and the other Rangers believed the drugs coming into San Antonio, and all parts of Texas, were originating from that tiny, almost nonexistent blip on the map. When Brock had failed to show up for their scheduled meeting a few hours earlier, she'd gotten tired of waiting around, did a little snooping and found out from one of the other agents where he was. She'd punched in the location of the church in her GPS and driven straight there. Not wanting to give herself away, she'd circled the building twice, then found a suitable parking spot that would enable her to be of some help should Brock need it, yet far enough away not to tip off the informant. When she saw how Lenny had been acting, the hairs on her neck stood straight up. When that happened, she knew to pay attention. She'd pulled her weapon. Creeping in closer hadn't been a problem underneath the shelter of the trees. Now, the ordeal was coming to a close. As she reached her vehicle, she heard the scream of sirens and saw the flashing lights of the approaching ambulance. Help had arrived and she could get back to the office. Anxious to get on with her reason for being in El Paso, she drove with a single-minded purpose and thought about the man she would be working with. A very good-looking—in a Brad Pitt sort of way—man. From the sandy blond hair and flashing blue eyes to the perfect smile. Her heart trembled at the memory of the smile that flashed white teeth and deep dimples. The fact that he probably hadn't shaved in two days didn't detract from his attractiveness at all. On the contrary, she liked the rugged look. Gisella blinked at her thoughts. What in the world was she doing? She didn't think she even liked the man and she was daydreaming about how good-looking he was. When was the last time she'd done that? You're here for a reason, she reminded herself sternly. The mental admonishment brought her up short. She was here to find a way to bring down the Lions of Texas, a group responsible for the death of her boss, Captain Gregory Pike. The Lions had already made millions of dollars smuggling their drugs over the border from Mexico. Her desperate hope was that Brock Martin might have some answers for her on where their entry point was. When she'd learned she was to be paired up with the drug enforcement agent, she'd done her homework and researched everything she could find on him. Which wasn't much. But she had learned that he'd been working the border for more than 10 years, was experienced and well-liked in his department. She hoped together they could pool their resources and bring down the Lions. She parked at the entrance to EPIC—the El Paso Intelligence Center. Agencies currently represented in the building included the Drug Enforcement Agency and almost every division of law enforcement one could think of. Their job was to keep the border—and the citizens in the surrounding small towns and cities—safe. And she was going to have a hand in that. Climbing out of her car, she headed inside and made her way to the department she'd left only a couple of hours ago in order to rescue her temporary partner. Sitting at her desk in the office she'd been assigned upon her arrival, she stared at the desk opposite hers. Brock Martin. DEA agent. One who sometimes acted as the Lone Ranger. Sometimes followed the rules, sometimes not. But still, from all appearances, a good man who got the job done. "Lord, I hope You'll let me in on this plan of Yours that seems to be unfolding." Gisella jerked at the deep voice and whirled to find Brock standing in the doorway looking at her. She felt the heat crawl into her neck and knew within seconds her cheeks would be fiery in spite of her olive skin. "Something like that. You got here fast." He pulled off his gloves then shrugged out of his heavy coat to drape it over the back of his chair. As he lowered himself into the seat, he said, "Backup got there pretty quick. I didn't have to hang around much longer." He steepled his fingers under his chin. "So. We're going to be partners for a while, huh?" "Looks that way." She tried to ignore how well he filled out his pullover gray sweatshirt and how his blue eyes regarded her with an intensity that seemed to reach into her very soul. She cleared her throat. "So…why didn't you have any backup tonight?" "Not everybody takes backup with them when they meet an informant." She eyed him. "The smart ones do." He blinked. Then barked a laugh. "Right. Well, it just so happens that I had backup with me, but he got a call that his wife was in labor. Needless to say, I sent him on his way." He rubbed a hand across his lips then frowned. "I'll admit, Lenny surprised me. For over a year, the man has provided solid information—and made a small fortune off of me." He shrugged. "I had no reason to suspect tonight would be any different." Another pause as he looked at her. "I'm glad you tracked me down."